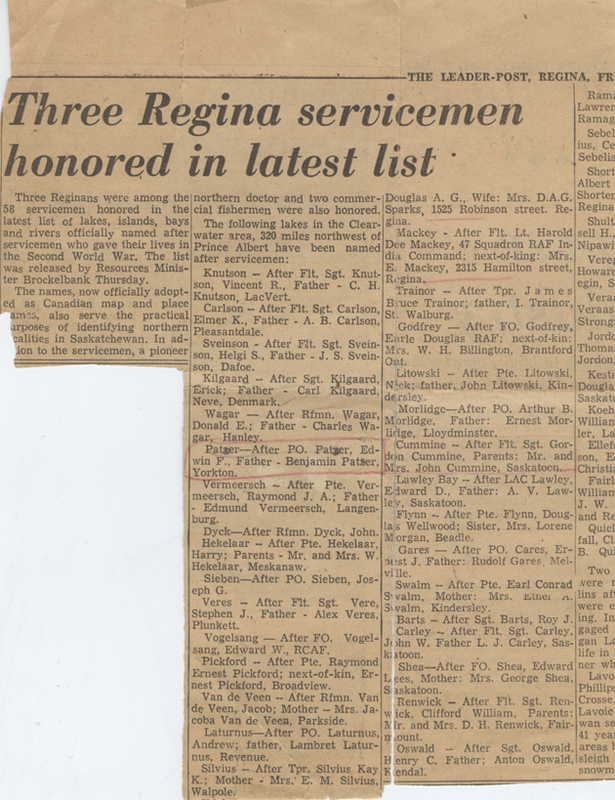 Three Reginans were among the 58 servicemen honored in the latest list of lakes, islands, bays and rivers officially named after servicemen who gave their lives in the Second World War. The list was released by Resources Minister Brockelbank Thursday. The names, now officially adopted as Canadian map and place names also serve the practical purposes of identifying northern localities in Saskatchewan. In addition to the servicemen, a pioneer northern doctor and two commercial fishermen were also honored. Knutson – After Flt. Sgt. Knutson, Vincent R., Father – C. H. Knutson, LacVert. Carlson – After Flt. Sgt. Carlson, Elmer K., Father – A.B. Carlson, Pleasantdale. Sveinson – After Flt. Sgt. Sveinson, Helgi S., Father – J.S. Sveinson, Dafoe. Kilgaard – After Sgt. Kilgaard, Erick; Father – Carl Kilgaard, Neve, Denmark. Wagar – After Rfmn. Wagar, Donald E.; Father – Charles Wagar, Hanley. Patzer – After PO. Patzer, Edwin F., Father – Benjamin Patzer, Yorkton. Vermeersch – After Pte. Vermeersch, Raymond J.A. ; Father – Edmund Vermeersch, Langenburg. Dyck – After Rfmn. Dyck, John. Hekelaar – After Pte. Hekelaar, Harry; Parents – Mr. and Mrs. W. Hekelaar, Meskanaw. Sieben – After PO. Sieben, Joseph G.
Veres – After Flt. Sgt. Vere, Stephen J., Father – Alex Veres, Plunkett. Vogelsang – After FO. Vogelsang, Edward W., RCAF. Pickford – After Pte. Raymond Ernest Pickford; next-of-kin, Ernest Pickford, Broadview. Van de Veen – After Rfmn. Van de Veen, Jacob; Mother – Mrs. Jacoba Van de Veen, Parkside. Laturnus – After PO. Laturnus, Andrew; father, Lambret Laturnus, Revenue. Douglas A.G., Wife: Mrs. D.A.G. Sparks, 1525 Robinson street, Regina. Mackey - After Flt. Lt. Harold Dee Mackey, 47 Squadron RAF India Command: next-of-king: Mrs. E. Mackey, 2315 Hamilton street, Regina. Trainor – After Tpr. James Bruce Trainor, St. Walburg. Godfrey – After FO. Godfrey, Earle Douglas RAF; next-of-kin; Mrs W.H. Billington, Brantford Ont. Litowski – After Pte. Litowski, Nick; father, John Litowski, Kindersley. Morlidge – After PO. Arthur B. Morlidge, Father: Ernest Morlidge, Lloydminster. Cummine – After Flt. Sgt. Gordon Cummine, Parents: Mr. and Mrs. John Cummine, Saskatoon. Lawley Bay – After LAC Lawley, Edward D., Father: A.V. Lawley, Saskatoon. Flynn – After Pte. Flynn, Douglas Wellwood; Sister, Mrs. Lorene Morgan, Beadle. Gares – After PO. Gares, Ernest J. Father: Rudolf Gares, Melville. Swalm – After Pte. Earl Conrad Swalm, Mother: Mrs. Ethel A. Swalm, Kindersley. Barts – After Stg. Barts, Roy J.
Carley – After Flt. Sgt. Carley, Jon W. Father L. J. Carley, Saskatoon. Renwick – After Flt. Sgt. Renwick, Clifford William, Parents: Mr. and Mrs. D.H. Renwick, Fairmount. Oswald – After Stg. Oswald, Henry C. Father: Anton Oswald, Kendal.